Botanical Name : Eupatorium triplinerve, Aristeguietia gayana, Eupatorium gayanum, Asteraceaes. Colds, asthma, bronchitis, breathing difficulties. Recommended: In respiratory system disorders, in allergies, bronchial asthma, common colds, etc. (drink the leaves, stems, and flowers in infusion). 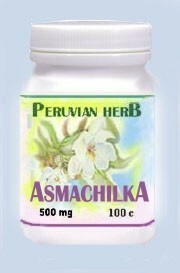 It is said; one glass of asmachilca tea at night may highly reduce bronchitis asthma problems. 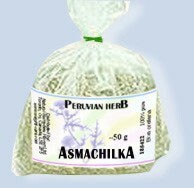 It clears up the mucus, it helps breathing, the results are visible after few days of usage. Drink only one glass at nights before going to bed since it produces strong sweating; If necessary change clothes. Warning: Do not use more than 5 grams per day, a larger dose may produce tachycardia.